Did you know that cultivated Christmas tree purify the air that we breathe during the first 10 to 15th years of their growth. They transform the carbon dioxide in the atmosphere into pure air. Our plantation extract at least 100 tons of polluting content off the atmosphere each year. By bying those tree, you participate in the perpetuation of the cycle because each spring, we replace all the cut tree during winter, by small tree from our plantation. For the holiday, we reserve you a family fun activity. 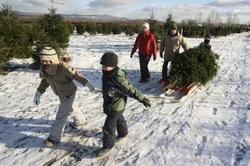 Choose and cut your own Christmas tree in a plantation is the best occasion to provide yourself a fresh tree, to get the fullest of an outdoor escapade with the family, in couple or among friends, and of course, to take a deep breath of fresh air. But, don't waste time, the season is ending December 23rd, otherwise, we will meet you next year. We provide the tools you need, no need to bring the saw or the sleigh, we have it all, but you can also bring your kids favorite sled. Just remember that this time of year, days are shorter and it's getting dark by 4 pm, so we recommend that you show up as early as possible to choose your tree in our plantation. Don't worry for the packing, we wrap your tree into a net, which will make things easier for the transportation. We only accept cash for payment, the closest ATM is in Bromont at 8 Km (5 miles) of the field. We are open 7 days/week from 8 am to 5 pm, starting at the beginning of November. Availability for 5 to 12 ft.
Price vary from 4 to 5 $ dollars a foot.